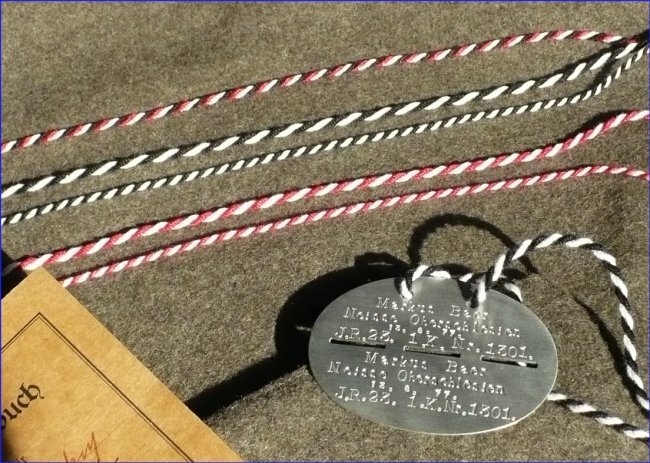 These are 100% cotton neck cords for WWI German ID discs. The red/black/white represents German national colors. Other color combinations represent various states, such as black/white for Prussia. About any color combination can be made, as well as plain white. Note that most combinations can be made in "thick" and "thin" varieties. Price is the same for either weight. 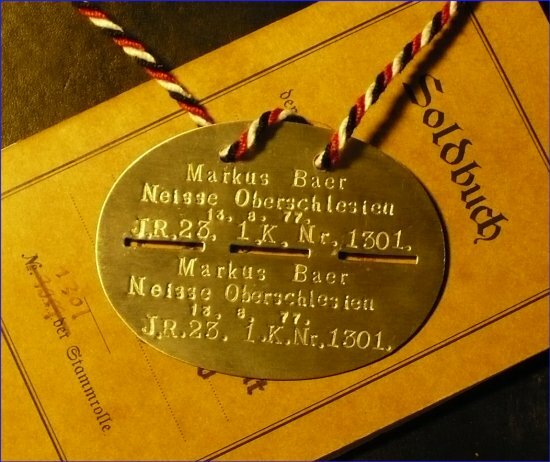 When ordering, please state color combination desired (or your German state) and thick or thin diameter. Note how the neck cord is threaded in the picture below. I found some original examples done this way. Cords were often simply threaded in and out of the same side. However, when threaded in a "spiral" fashion as shown below, the tag lies flatter against the body, and the tendency for the knot to creep around to the front is greatly reduced. It is a very simple but clever fix for those issues.